There are occasional hints of blue sky and miraculous sunbeams, but then the clouds thicken again and the rain resumes. The weather pattern has actually become familiar over the last couple of years. 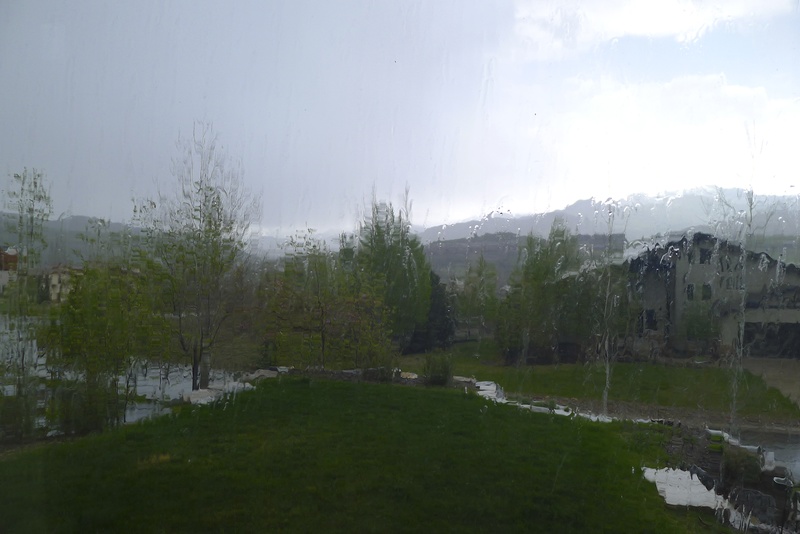 Winter is relatively dry; spring is WET. It infuriates us: my husband as he sadly places his skis in the gear closet until October, and me as I stroke the colorful sundresses hanging unworn in my closet. 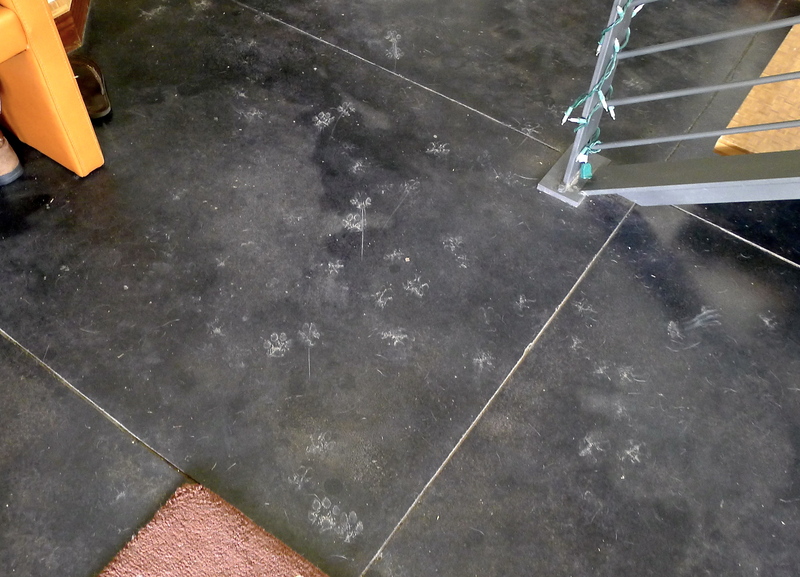 We won’t even talk about muddy paws. 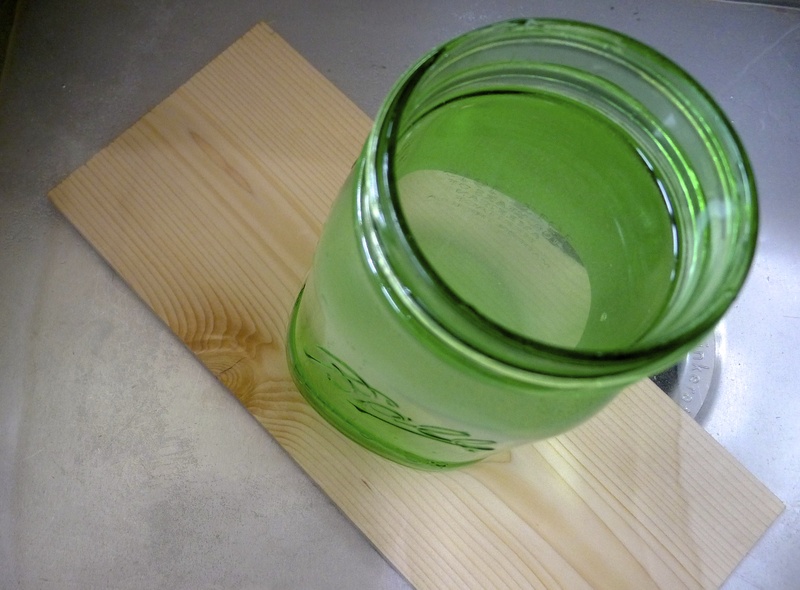 On a recent trip to Home Depot for non-toxic weed killer (newsflash: weeds LOVE rain), I picked up a package of cedar planks in the grill section. The package of two planks sat on the dining room table near the door that leads to the BBQ’s patio for days until finally, we decided that the rain was never, ever going to stop. 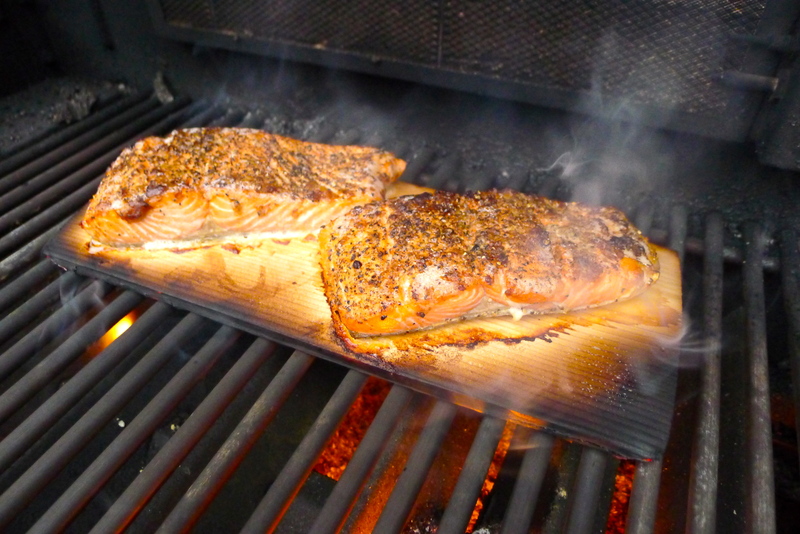 There are evenings when, despite the downpour and chill in the air, you simply must fire up the grill. John could wear a raincoat. 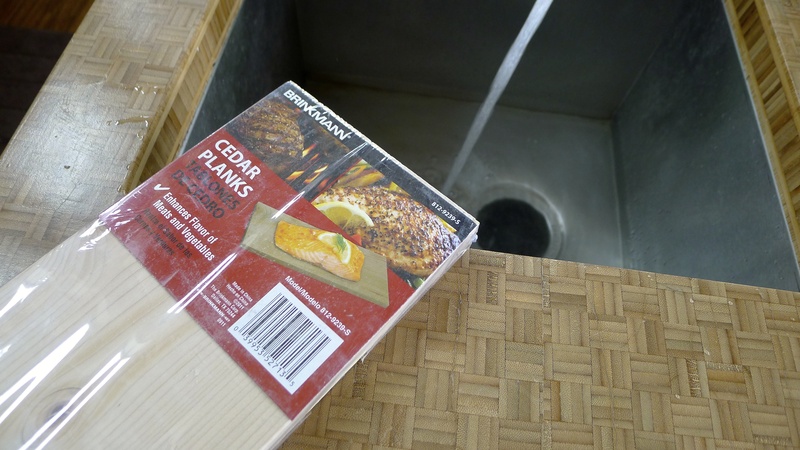 The plank needed to soak for a few hours before grill time. 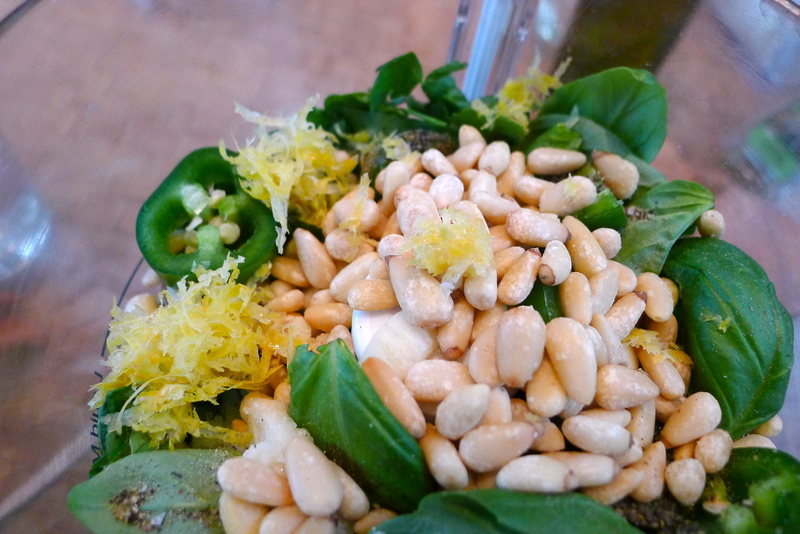 While it took a bath in the sink, I put together a sort of pesto hybrid. 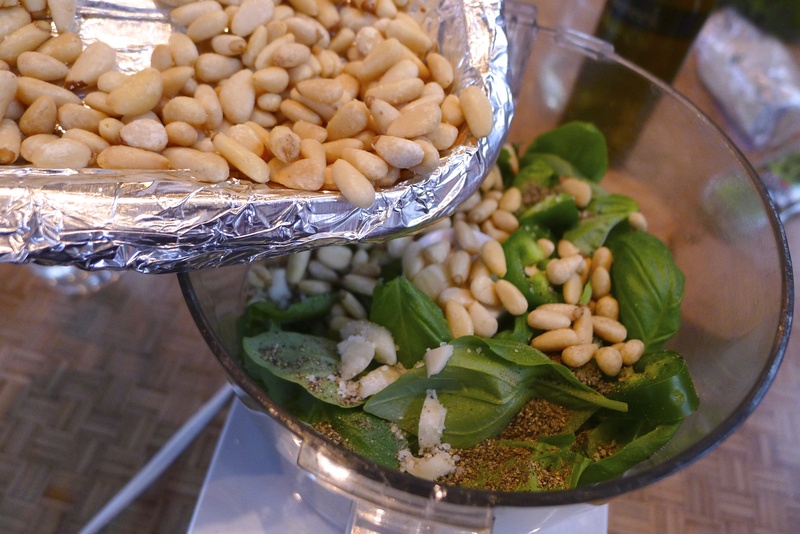 A traditional pesto combination is basil, garlic, Parmesan cheese, and toasted pine nuts. I also grabbed mint and parsley, a lemon, and a jalapeño. We like it hot! 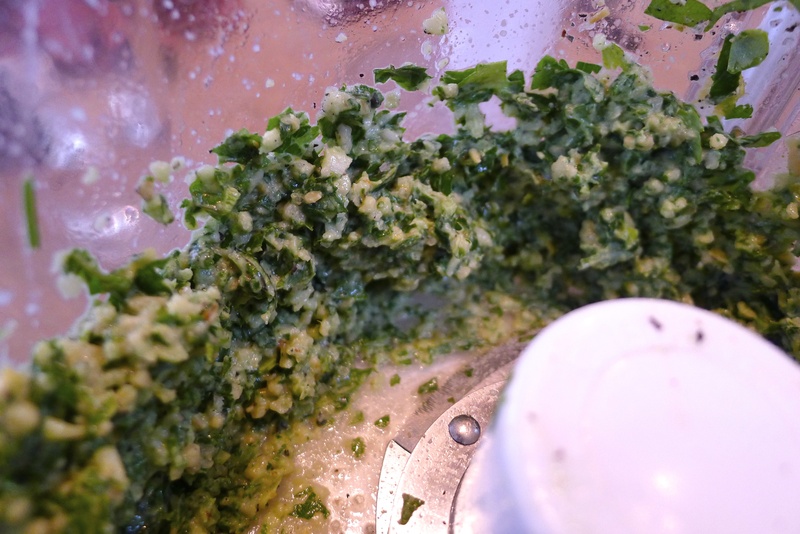 It’s surprisingly easy to make a homemade pesto- a little food processor does all of the work! 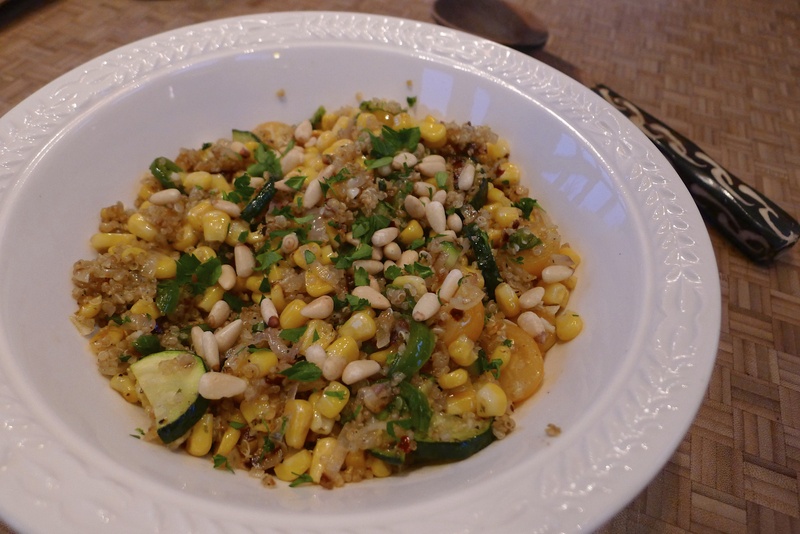 I blended together the herbs, garlic, jalapeño (seeds and all! 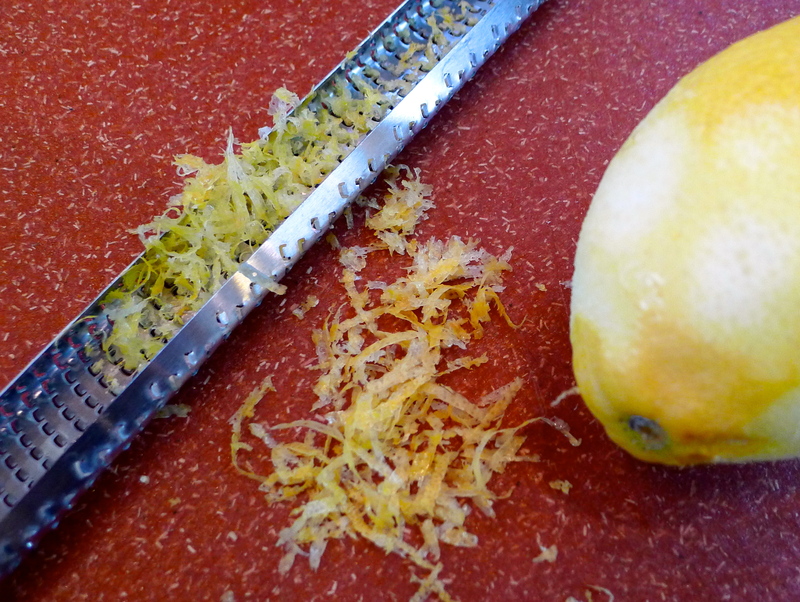 ), nuts, lemon zest and juice, and cheese. 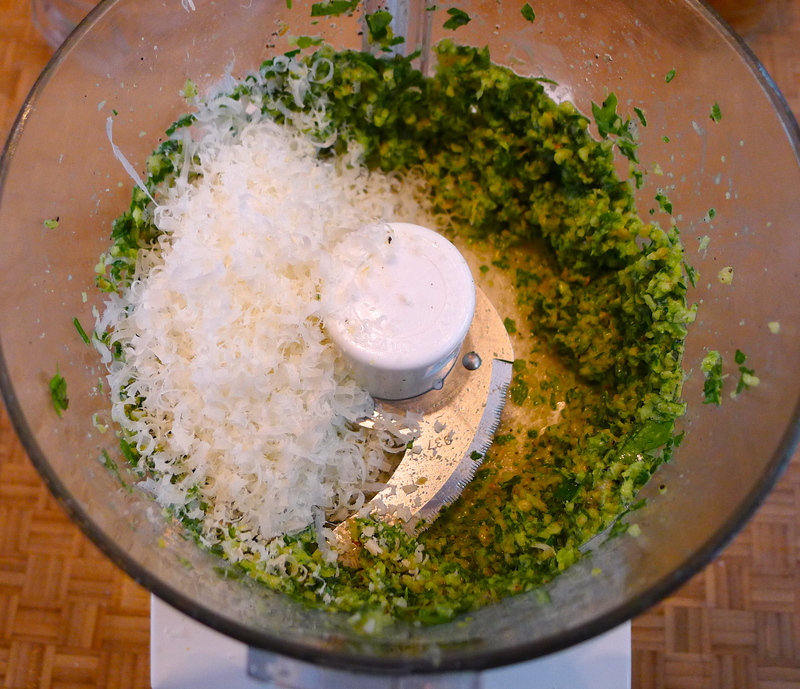 Then, with the processor going, I poured in some olive oil until the pesto was creamy but still a little bit thick in texture. 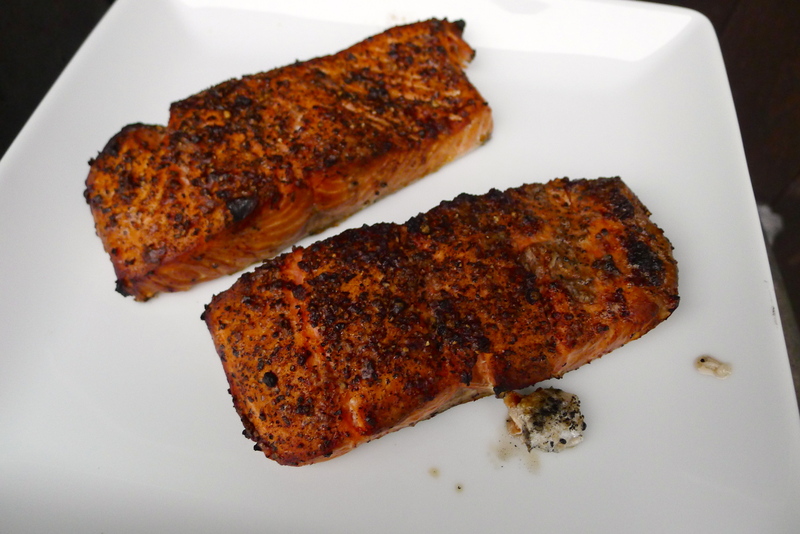 I added salt and pepper to taste and set the sauce in the fridge until salmon time. How easy was that? 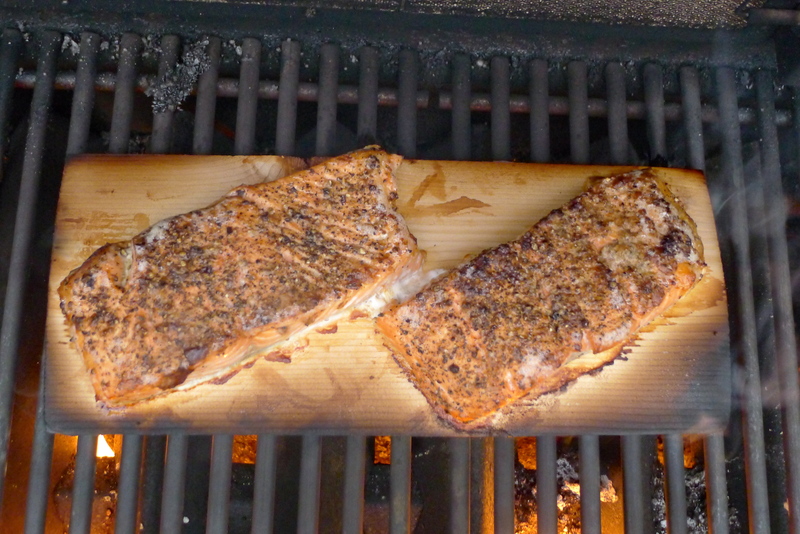 It was our first experience grilling on a cedar plank. 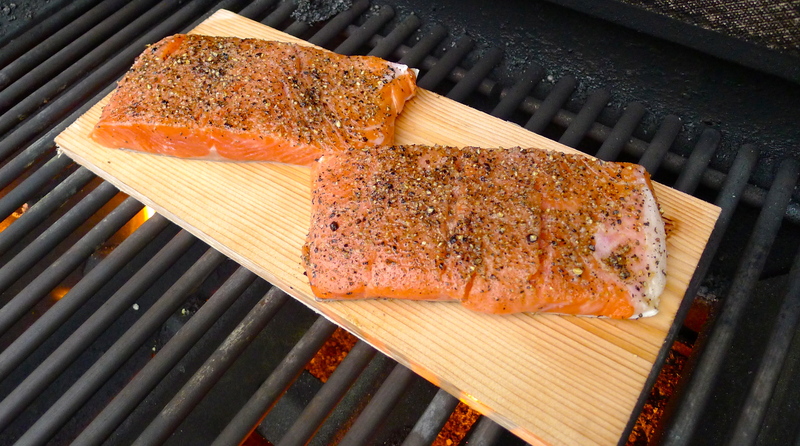 We oiled it and placed the well-seasoned salmon filets on it, skin side down. 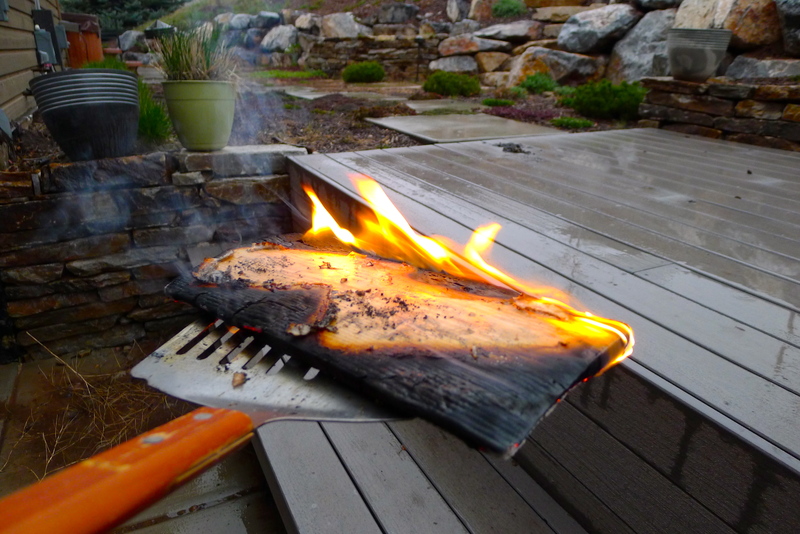 Things were looking fabulous…until the plank caught on fire. Perhaps we didn’t soak it long enough. 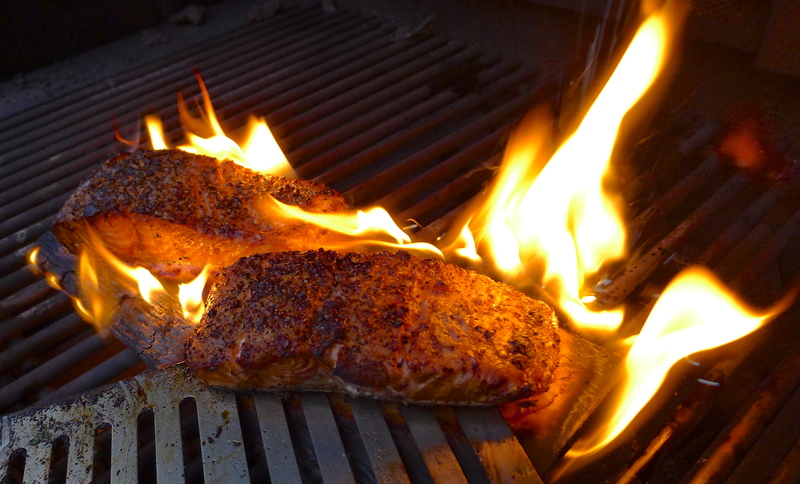 Perhaps the grill was too hot. 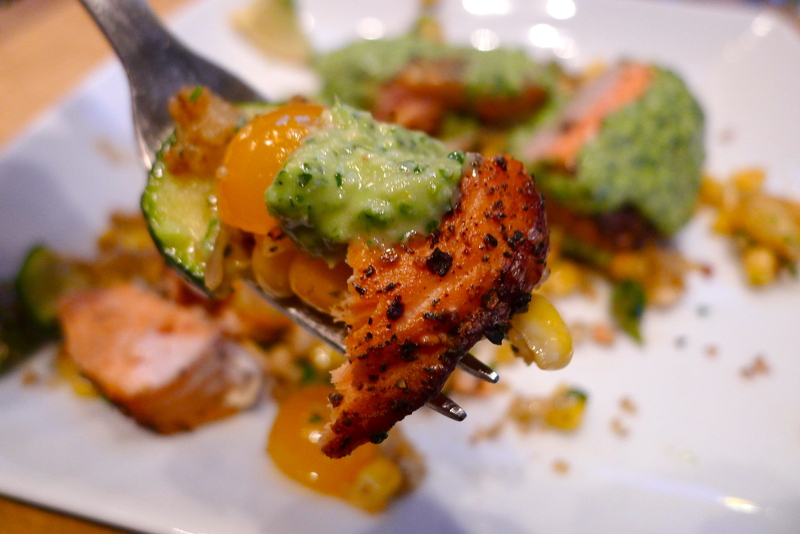 But the salmon was ready, and a little char never hurt anyone. The rain conveniently put out our fire. 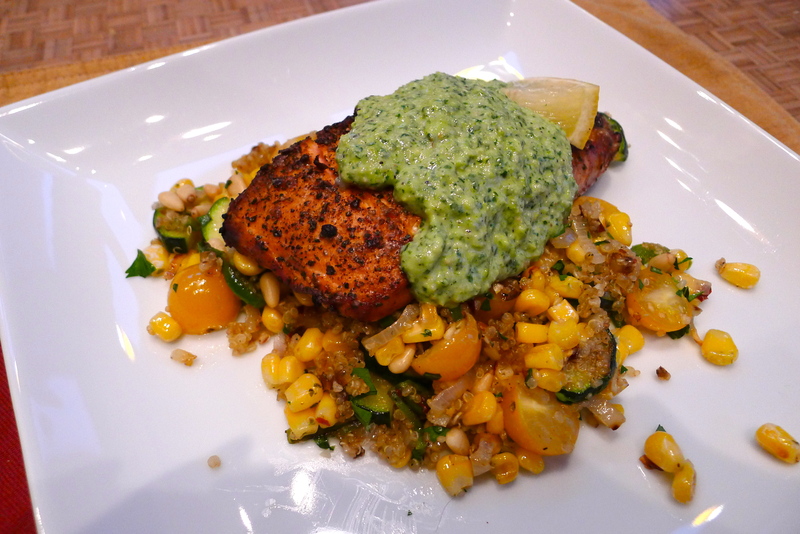 I served the salmon over a pile of quinoa-veggie hash with a big dollop of the spicy herb pesto on top. We squeezed a bit more lemon juice over the whole plate before diving in. 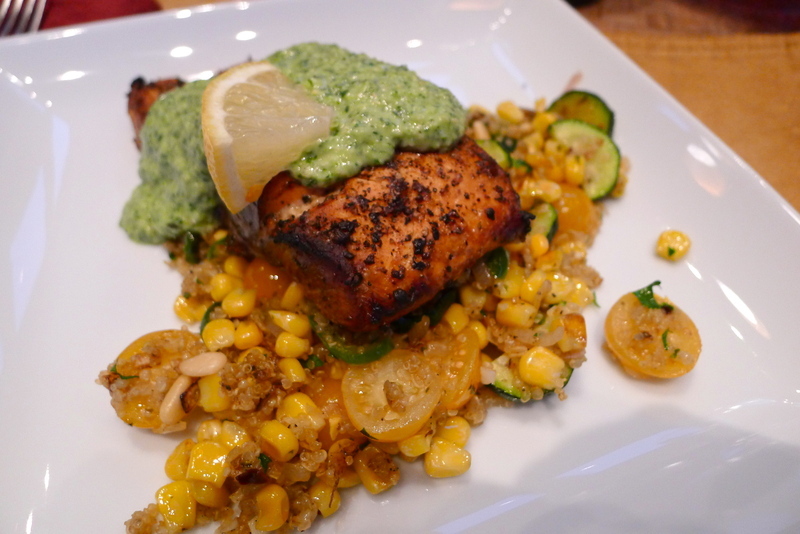 The salmon was scrumptious- flaky, still moist, charred the perfect amount with just a hint of cedar. 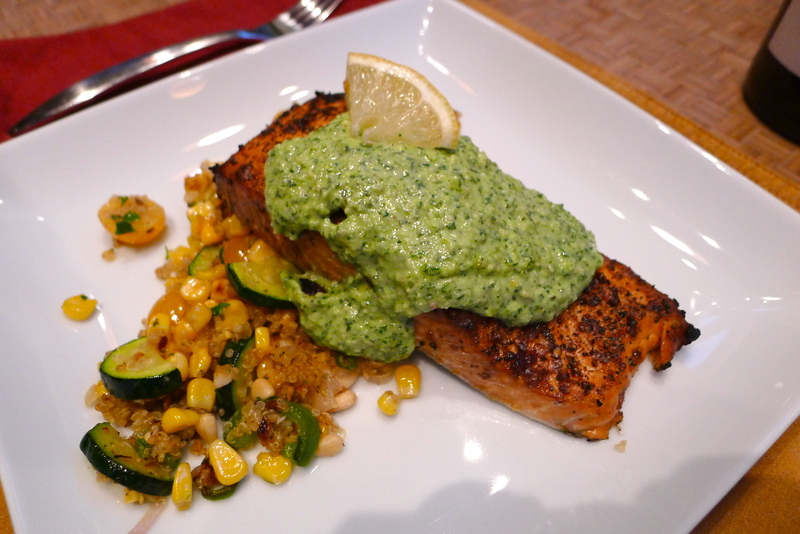 It was the pesto that really made the dish! It was at the same time fresh, creamy, and spicy. The lemon brightens up the flavor and the jalapeño brings the heat. 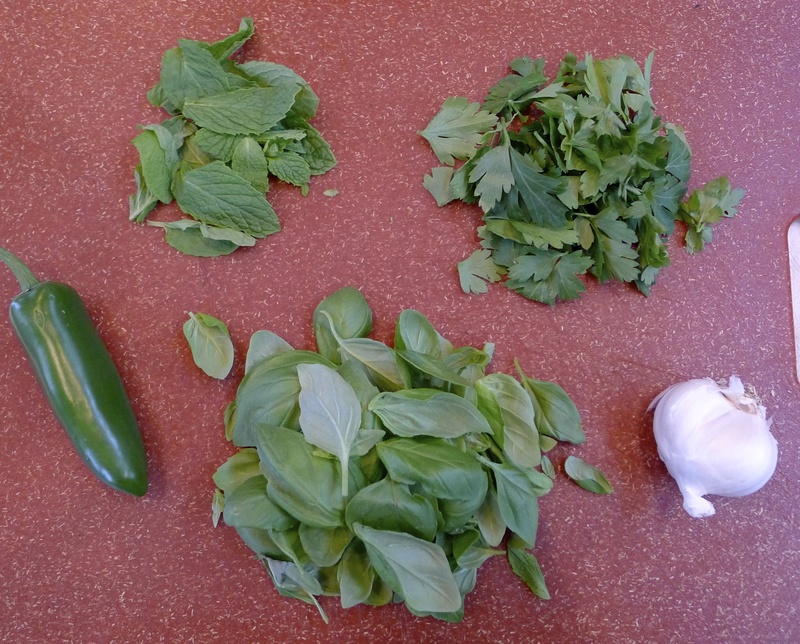 Any herbs would work, and it would be amazing over chicken, grilled veggies, or other types of fish- even stirred into pasta. 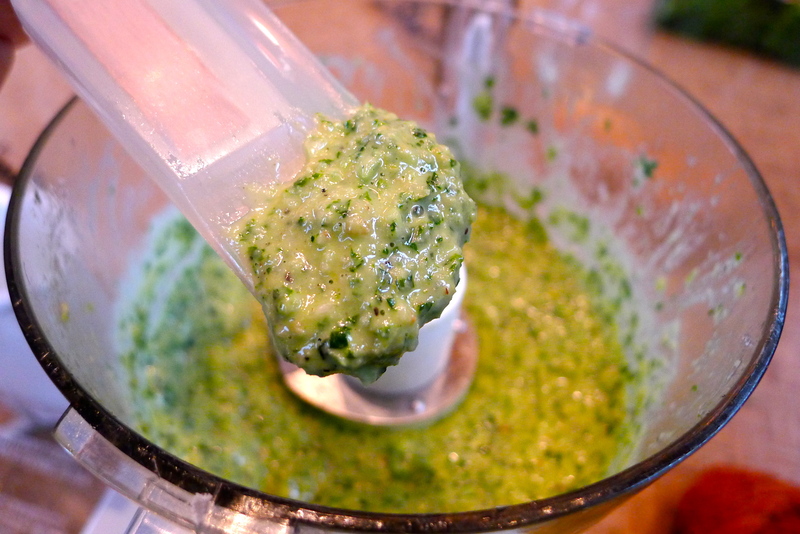 It’s a delicious alternative to a traditional basil pesto. Each bite makes you thankful that springtime is here! And the rain will stop…eventually. 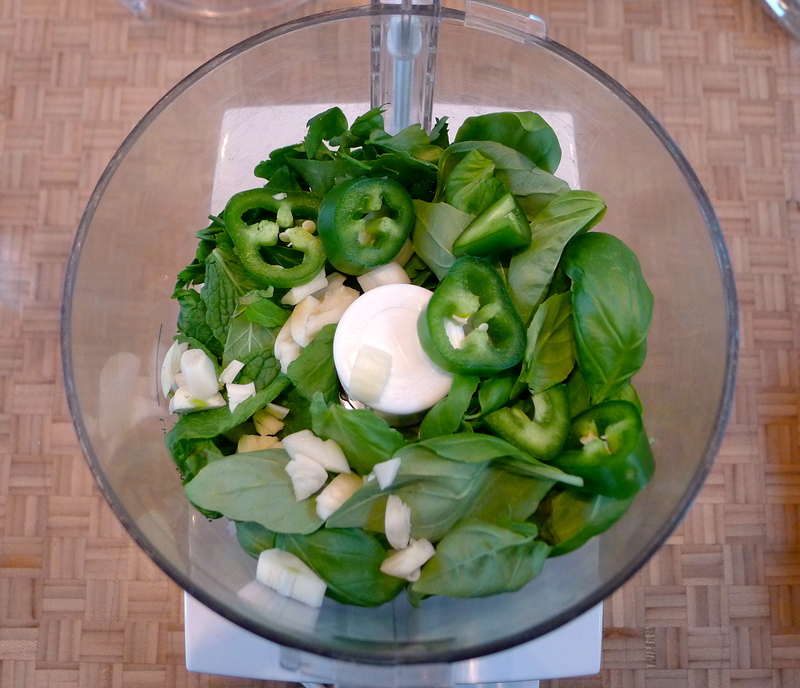 Combine first 8 ingredients in a food processor. With the machine running, slowly stream in the olive oil and process until well combined but still thick and textured. 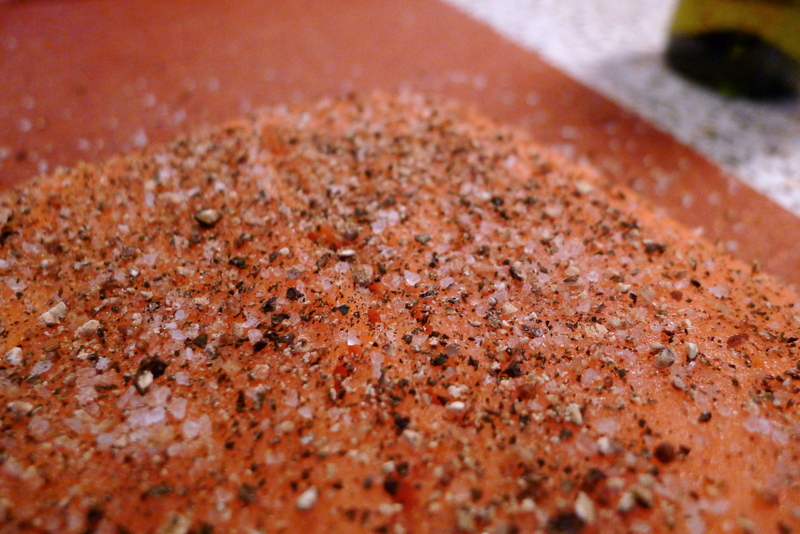 Add salt and pepper and adjust seasonings to taste. 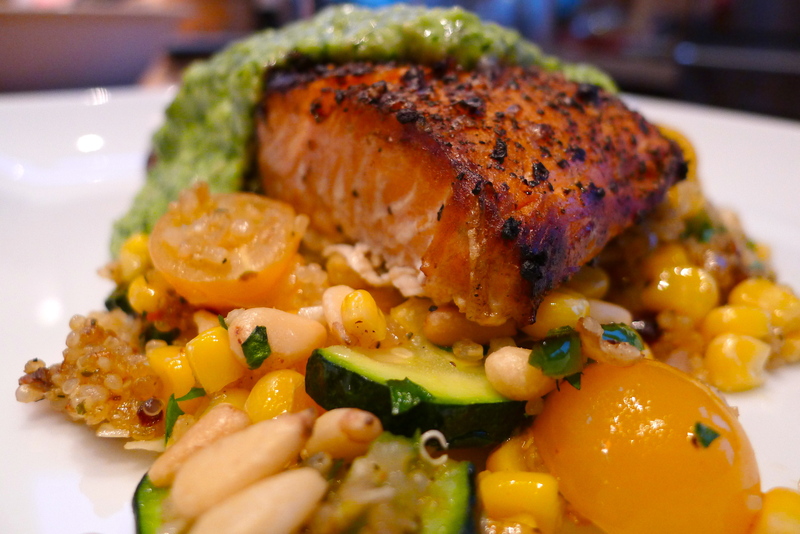 Serve over any grilled protein, veggies, pasta, or cedar-charred salmon. Cheers to the warm weather that will eventually arrive. YUM. 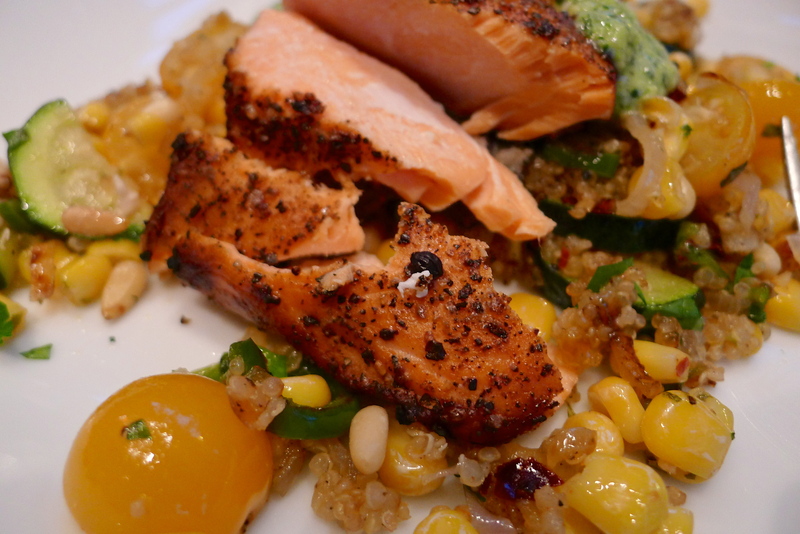 The New 52: A recipe for each week in 2015. 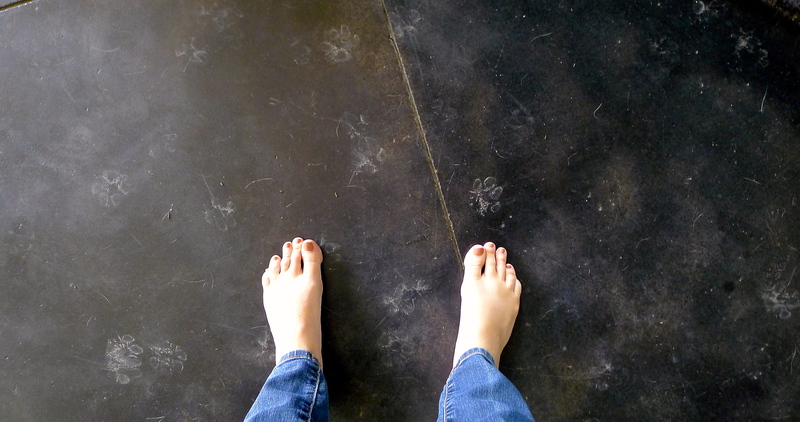 Next postThe (wet) trails of springtime.